Organic chemistry may seem an unusual selection as a first class for many OLLI members, but for Ginny it was an instinctive choice. The subject appealed to her natural affinity for analytical and deductive thought—which had also helped shape her distinguished career as an educator and administrator in mathematics and sciences. After earning her Ph.D from the University of Oregon, Ginny taught at a number of colleges in the US and Canada. Eventually she joined Meredith College, where she served as Professor of Mathematics, Chair of the Mathematics and Computer Science Department, and ultimately Dean of Natural and Mathematical Sciences; Ginny retired from Meredith in 2006. That organic chemistry class also marked the beginning of Ginny’s volunteer service with OLLI, when she served as class assistant for the first time. She has also volunteered on the Curriculum Sub-Committee for Science and Technology, and the Instructor Relations Committee. 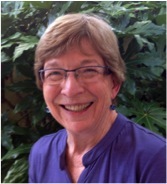 Ginny now chairs the OLLI Curriculum Committee, applying her considerable expertise to the mission of developing a rich array of stimulating, engaging courses for OLLI members. The Curriculum Committee also recruits potential instructors and assists them in all aspects of course development. Ginny’s vision for OLLI’s curriculum offering includes adding some evening and weekend classes to better accommodate OLLI members who work full time; developing an improved follow up process on course requests; and implementing a “Suggest a course” page on the OLLI at Duke website. “I want to engage our OLLI members, so they feel more ownership of the program.” She also wants to include more information in the course descriptions, such as whether or not the class requires homework, prerequisites, or a minimum activity level. As an OLLI student, Ginny has not limited herself to left-brain pursuits. In addition to science and math subjects, she has also taken courses in art, architecture, modern and postmodern music, and warm glass fusing – a class she’s taken three times to continue developing her skills in this unique craft. Ginny is passionate about OLLI because it satisfies her desire to learn. “When I retired, it was from work—it wasn’t a retirement from learning.” And she volunteers because “it’s always best to volunteer for things you feel passionate about.” If you’d like to join the Curriculum Committee, or have ideas for new courses, please contact Ginny at Curriculum@olliatduke.org.